KoopaTV: Rawk's Lost Bet: Virtual Console Donkey Kong Games! All the Donkey Kong Country games up six months ago are still available for purchase. Donkey Kong Country 3 is rightfully the lowest-ranked. Since those games came out, DK Jungle Climber came out in July to complement DK King of Swing, already there. They don't look very popular though. Donkey Kong 64's page on the Wii U eShop! So that came out after we made our bet. It's very clear that not only has Donkey Kong remained on the Nintendo eShop, but he has actually flourished on it. So Rawk is clearly wrong and lost the bet. Take him away to the gallo-... the streets! And there you have it. Rawk dancing on the streets with ethnic minorities. "it was such a surreal experience that I decided to stay with the ethnic dancers indefinitely"
And then I never heard from him again. Neither has any other KoopaTV staffer. Let's note from the video that you see Rawk for the first ten seconds of the twenty-seven second video. The camera starts on him... and then it pans towards the other folks there. Then for the rest of the video, the dude who it's supposed to be about isn't there. And you'd think he would be there since the video is titled "Rawk Dances to Route 216". But what if... what if he really is in that entire video? What if he actually transformed into one of the people in the last two-thirds of the video? In that case... The RawkHawk2010 we all know and love... is now a different person entirely. However, what really matters is the content of his character. Is he the same person inside? It was recently two years since the release of our videogame, Trayvon Tyson's Punch-Out!!. That was all about this kind of topic. Well, if Rawk is staying with some dudes he literally met off the street over the folks he's known for over a decade, then... I don't think he's the same person inside anymore. Would this revolution of Rawk's nature have happened if we never made that bet? It's unclear. Rawk's always been a loose cannon, having loved the Blast Barrels in the Donkey Kong Country franchise. Either way, I blame Splatoon's Team Dance. It's a damn good thing they lost to Team Sing. But yeah, Rawk has already been out of KoopaTV's staff twice. The first was a dramatic leave of absence that brought KoopaTV down for a whole month, and the second he got placed on unpaid administrative leave for another month. Now it's a third time. Patterns say this'd be another month-long event, but who knows. Either way, one wonders if Rawk's transformation is... permanent. Then maybe if he comes back, he could lead KoopaTV BLK ™. Ludwig is happy to be winning bets, at least. That said, now there's a big hole in KoopaTV's staffing that needs to be filled, so check out our Jobs page to see how you can get involved! Also, go get yourself one of those Donkey Kong games from the eShop. Need funding for it? No problem! Just win the KoopaTV Loyalty Rewards Program, which just freshly began Round 4! Win a $10 Nintendo eShop code, or equivalent amounts for the other game consoles! This isn't the first time Rawk uploaded a video of someone dancing to Route 216. He did the same with Harry Potter here. This is also not the first time you could see Rawk on video. He interviewed Herman Cain in-person at a Tea Party rally here. Rawk came back to KoopaTV... only to cause harm. Rawk finally came back to KoopaTV for presumably pro-KoopaTV purposes. The Donkey Kong Country games are still on the eShop by 2018, unless your sub-title is Tropical Freeze. I got lucky and managed to get DKC3 before it was taken off the Wii Shop Channel the first time, I never played it before and wanted to see if I would be on the side of like or dislike for this game. I can see why views are mixed for it. I bought DKC2 long before that. Played the first game on a real cart long before that and also own the GBC port so found no need to get that. Great to have options though. Transferred DKC2 to Wii U in order to make use of the Tropical Freeze sale if you bought a Virtual Console game and transferring also worked for that sale. I got 200% on DKCR (Wii version, don't own 3DS version). I got unlucky and LET'S PLAYED it from the Wii Shop Channel. First time I played DKC3. First played DKC on the GBC, which was a disaster because it's such a bad port. Then played DKC2 on the GBA remake, which was very, very pleasant. ^.^ And I recommended DKC2 GBA to Rawk many years ago, and it was based on that that he became a big Donkey Kong fan. I've maxed out % of Tropical Freeze and also did the same for Returns, though in Returns I did not do the Mirror Mode thing for all the stages. I did do that for Tropical Freeze. 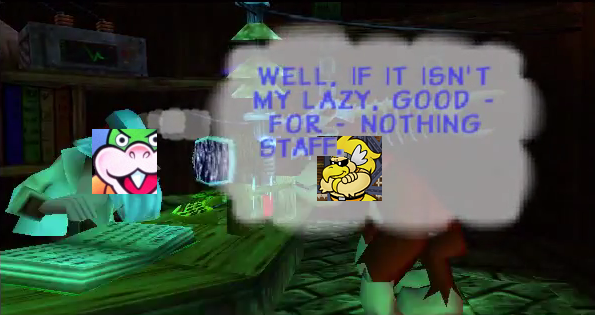 I never played DKC3 before either. Lucky in at least I had the chance to see for myself why it is a game with mixed reviews. Sometimes I prefer judging things for myself rather than taking someone's word for it. If I did not, I would never have touched the Pokemon Mystery Dungeon series as that was really hated by tons of "professional" reviewers. 200% in Returns means doing Mirror Mode as well. Not part of the percentage but I also got all the puzzle pieces. Thankfully speedrunning is not part of the percentage because I like taking things slowly in games as I like to savor the moment in most games and take in scenery and the like. Okay I didn't max out % in Returns then. But I did get all the collectibles in both games! Wait, in neither of your comments did you actually give your opinion on DKC3. All you've said is that OTHER people liked it or hate it. I have not finished the game. I bought it on VC either on 2012 or a bit before (I remember because I had it before Hurricane Sandy hit and took away my internet connection and landline so I had some way to entertain myself) so that should tell you just how motivated I am to play it. I stopped somewhere with the Snowman boss or the water level that reverses controls, which ever is later. Meanwhile in DKC2 I played through all levels even if I did not max out percentage. Oh yeah, I maxed out DKC2's percentage. AND did Diddy's Dash speed-runs. I dunno how good my scores were but I tried pretty hard at them and put a lotta effort. Oh wait, I do not think I ever played the K Rool rematch of DKC2. But pretty sure I went through all "normal levels" otherwise including such levels like Animal Antics. Oh, so you did the Lost World levels, but not the Lost World boss fight? Well it's not reaaaally that worth it that I'll ask you to go back and play it. Though it's a bit strange. You never played it? So you never even tried?